A herpetic ulcer is seen microscopically to have a sharp margin. 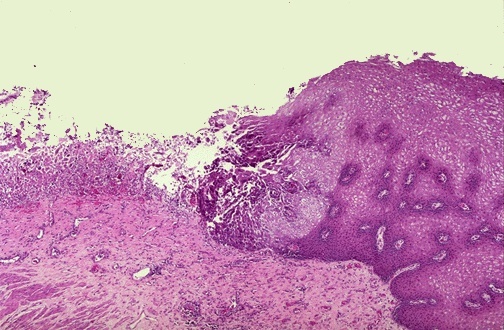 The ulcer base at the left shows loss of overlying squamous epithelium with only necrotic debris remaining. 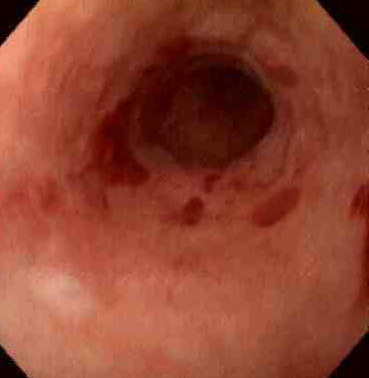 In the upper GI endoscopic view below, there are rounded, erythematous ulcerations of the lower esophagus. Biopsies of these lesions reveals intranuclear inclusions in squamous epithelial cells indicative of herpes simplex virus esophagitis. This patient was immune compromised from chemotherapy.